Beer, chicken, and the Summit Charcoal grill. What better combination can you ask for? Anytime these words are used together it is sure to be a good time with great food. Right now we are going to look at a great tasting, easy dish: Buttermilk Brined Beer Can Chicken. This recipe combines a number of flavors including garlic cloves, buttermilk, Worcestershire sauce, beer and much more. Brining the chicken will add flavor and ensure the chicken remains tender and juicy throughout the cooking process. The Gourmet BBQ System Poultry Roaster allows the chicken to soak up all of that great flavor from the brine while still leaving plenty of room on the perimeter of your grill for anything else you desire with your meal. Check out the recipe below and get your friends and family together for a day filled with a great grill, and great fun! What are some of your favorite ways to make Beer Can Chicken? 1. In a large bowl or large lipped measuring cup, combine the brine ingredients. Place the chicken in a 1 gallon resealable plastic bag with head cavity down and the leg cavity up toward the bag’s opening. 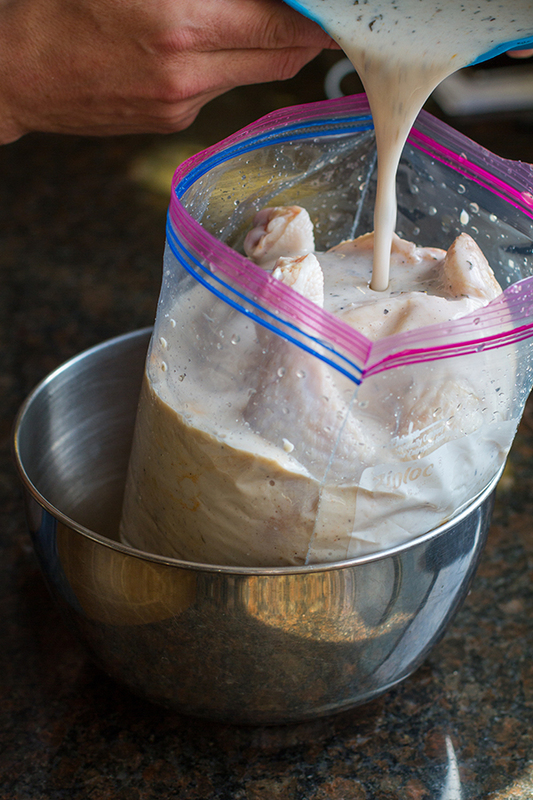 Pour the brine into the bag, making sure to fill the chicken’s cavity so all the brine will fit. (If your chicken is bigger than 4½ pounds, you may need to use a larger bag.) Press the air out of the bag, seal tightly, and set in a bowl to guard against leakage. Refrigerate 12 to 24 hours, turning the bag once or twice, if possible. 2. Remove the circular Gourmet BBQ System™ grate insert, and prepare the grill for indirect cooking over medium heat (350°F to 450°F). 3. Place the poultry insert on a rimmed baking sheet for ease of transport. Remove the chicken from the brine and discard the brine. Pat the chicken dry inside and out, with paper towels. Pour the beer into the center cup of the poultry roaster. Place the chicken, leg cavity-side down, wings-up, on the center cup so it sits firmly. Tuck the tips of the wings behind the chicken’s back. 4. Transfer the poultry roaster to the grill and set it securely in the grate with the back of the bird facing the flames. Grill over indirect medium heat with the lid closed. At the halfway point, put on BBQ mitts and swivel the roaster 180 degrees to ensure even grilling. Cover the neck and wings with foil if they begin to darken. After 1¼ to 1½ hours, insert an instant-read thermometer to the thickest part of the thigh (not touching the bone) to check for doneness (160˚ to 165°F). 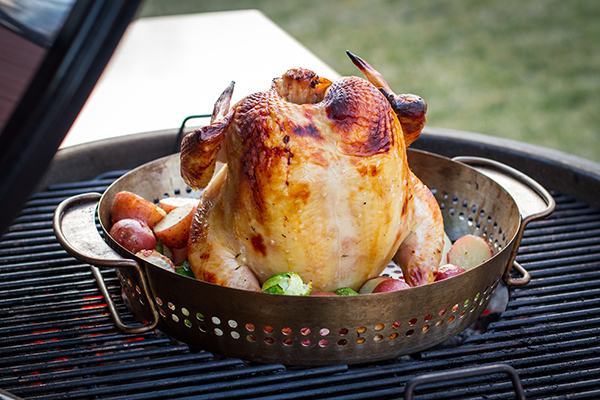 Carefully remove the poultry roaster from the grill and set on a clean rimmed baking sheet. Let the chicken rest 10 to 15 minutes. Carefully lift the chicken from the roaster and cut into serving pieces.